A cardiologist testified Wednesday that Michael Jackson "would've been alive" today if not for what he called the "strange" behavior of the superstar's personal physician during the critical early hours of June 25, 2009. 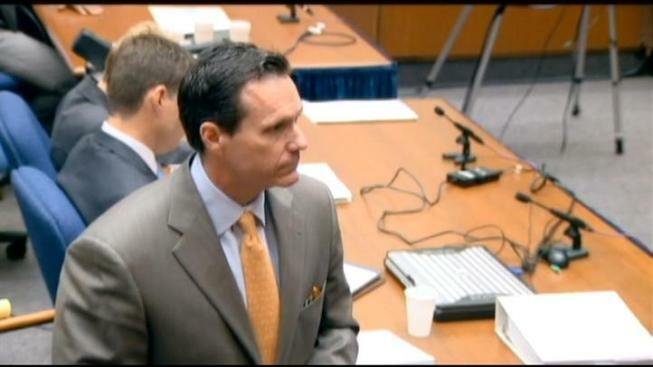 Dr. Alon Steinberg was called to the stand early Wednesday in Dr. Conrad Murray's involuntary manslaughter trial. He testified that Murray's treatment of Jackson, especially the administration of the powerful anesthetic propofol, before the superstar's death deviated from general standards. "There are a lot of things you need to have monitored and a lot of different equipment," said Steinberg when asked about requirements for administering propofol, the drug Murray told investigators he administered to his patient after a restless night at Jackson's side. Beyond the equipment, Steinberg testified that is was Murray's failure to immediately call 911 upon noticing Jackson's condition was a critical mistake. "Personally, I would have called 911 first," Steinberg said under cross-examination. "It takes two seconds to dial and say, 'I'm a doctor, there's an arrest, come to 100 Carolwood now.' Put it on speaker, do your stuff. "If all these deviations hadn't happened, Mr. Jackson would've been alive." Murray told investigators that he conducted chest compressions upon noticing Jackson was not breathing, then called Jackson's assistant. A guard who responded to the bedroom, after a call from the assistant, testified that Murray told him to call 911. Many of Steinberg's conclusions about Murray's actions during the early hours of June 25, 2009 were based on detectives' interview with Murray, the cardiologist said. The recording was played earlier this week for jurors. Jackson's father, Joe Jackson, left court after hearing the searing criticism of the care his son's personal doctor gave him. "It should never have happened. I can't get over him being dead," said Jackson. Dr. Nader Kamangar, a sleep medicine physician who investigated Murray's care of Jackson for the California Medical Board, took the stand Wednesday afternoon. He testified that he found “extreme deviations” from the standard of care. Other experts in pulmonary and sleep issues are likely to testify this week for the prosecution as it wraps up its case against Murray. Earlier Wednesday, the Associated Press reported that attorneys for Murray dropped their claim that Jackson swallowed the fatal dose of the anesthetic. Attorney J. Michael Flanagan said a study commissioned by the defense showed any effect from swallowing propofol would be trivial, the AP reported. "We are not going to assert at any time during this trial that Michael Jackson orally administered propofol,'' Flanagan said. The disclosure was not made in front of jurors. Legal experts see this change in strategy as leaving a hole the defense needs to fill. But, the defense already knew this was coming and so, it has specifically avoided making any mention of swallowed propofol to the jury. "I think they can salvage it, but it's going to depend what their experts have to say," said legal analyst and attorney Steve Cron. "What they're going to say is that Dr. Murray, in this instance, was prudent and that he met the standard of care in dealing with this patient," said legal analyst Ed Navarro. "And, I think that's going to be their defense." How the drug was administered and by whom took the spotlight Tuesday during testimony from Dr. Christopher Rogers, who conducted the autopsy on Jackson. Rogers disputed the defense's theory that the King of Pop administered the fatal extra dose of the drug he called his "milk" when Murray left his bedroom at a rented Holmby Hills mansion. "The circumstances, from my point of view, do not support self-administration of propofol,'' said Rogers. "In order for Mr. Jackson to have administered the propofol to himself, you would have to assume he woke up and although he was under the influence of... propofol and other sedatives, he was somehow able to administer propofol to himself. "Less reasonable than what?'' Deputy District Attorney David Walgren asked. "The alternate scenario would be in order to keep Mr. Jackson asleep, the doctor would have to give him a little bit every hour, two or three tablespoons an hour,'' Rogers said, explaining that propofol wears off quickly. Prosecutors claim Murray gave Jackson the fatal dose, then failed to properly monitor his patient. During the trial's first week, a medical equipment executive testified that Murray did not have adequate equipment for the adminstration of the drug, usually used in a surgical setting. It's likely that Murray incorrectly estimated how much of the drug he was giving Jackson to induce sleep to fight insomnia, Rogers testified. During his interview with detectives two days after Jackson's death, Murray said the pop star pleaded with him during the night for something to help him sleep. Murray said it was about 10:40 a.m., June 25, 2009 when Jackson said, "'Please, please give me something.'" "So, I agreed at that time that I would switch over to the propofol and I would give him small amounts that would help him to sleep," Murray said during the interview. "I took all precautions that were available." The cause of death was "acute propofol intoxication and the contributing condition was the benzodiazepine effect," Rogers said. Two sedatives from the benzodiazepine drug group were found in Jackson's system. The defense cross-examined Rogers for two hours. Attorney J. Michael Flanagan wanted to know whether someone could inject drugs into an IV drip that Murray had started. "But if they pushed it all at once, that can stop your heart, can't it?" Flanagan asked. Defense attorneys have portrayed Jackson as desperate for sleep after his rehearsal for a series of upcoming concerts. The prosecution's case might conclude late this week, but the order of witnesses is not clear. Walgren told the judge Dr. Steve Shafer, a Columbia University professor who has studied propofol and its effects, would be prosecutors' final witness. Murray's attorneys will likely call on their own witnesses to testify about propofol. Most of Tuesday's testimony focused on medical evidence detailed by Rogers, but there were two emotional moments. The first came from Murray's interview with detectives when he told them about his encounter with Jackson's crying daughter, Paris, at the hospital on the day her father died. Later Tuesday, prosecutors displayed an image of Jackson's body next to a coroner's identification number during Rogers' testimony. Jackson's family members were notified before proceedings that the image would be displayed.